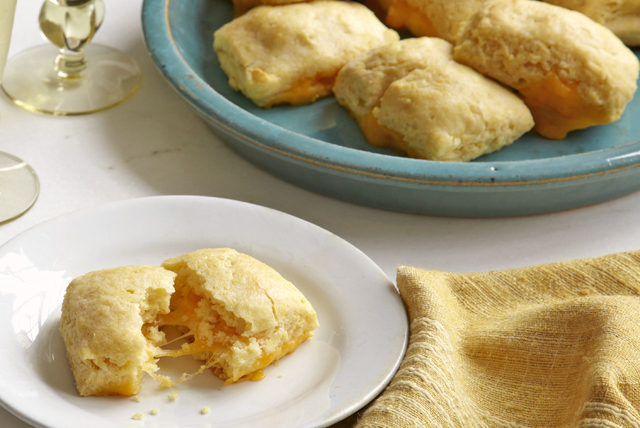 Ohh, the melty cheese inside these warm biscuits…if you thought your family went gaga over the regular kind, just wait. Knead on lightly floured baking sheet 10 times or until smooth. Pat or roll out dough to 12x8-inch rectangle. Cut into 12 (4x2-inch) rectangles with pizza wheel. Place 1 cheese cube about 3/4 inch from edge of 1 short side of each rectangle. Brush edges of dough with water; fold dough over cheese to form 2-inch square. Firmly pinch edges of dough together to seal. Arrange evenly on baking sheet. Bake 12 to 15 min. or until lightly browned. Wrap biscuits in foil. Bake in 350ºF oven 10 to 15 min. or until heated through. For a flavor twist, add 1/4 tsp. ground red pepper (cayenne), and/or 2 chopped green onions to the flour mixture before adding the sour cream mixture. Humidity and measuring accuracy can affect the quality of biscuits. If the dough is dry, add up to 1 additional Tbsp. milk to dough before kneading as directed. Also, flour the work surface with the least amount of flour possible to prevent the dough from sticking to the surface.